Summary: Screams for Heeeeeeath, Shazier, Gildon, Kirkland and Porter could be heard throughout the Mall at Robinson on the Ya Jagoff! Podcast stage yet again this week. The jagoffs were lucky enough to also interview Donna Groom, darling of song and stage, who has some love letters to speak about, as well as legendary pitchman and car guru, Richard Bazzy. We also welcome The Pittsburgh Business Show pioneer Linda Jo Thornberg to talk about her pregaming to next May’s Business Show as well as their charitable components. To listen, press the play bar below. If you don’t see the play bar above, in your email, click the one below to listen to the podcast while you drink your pumpkin-spiced whatever thingy. SPONSOR: Total Sports Enterprises will be at each Steeler Black and Gold Zone Tailgate parties at Rivers Casino with our partners the FAN. Expect signed jerseys and other black and gold finds at each home game tailgate. Plus, look to tseshop.com for up to date signings with your black and gold favorites as well as ways to save before the holidays. TSE doesn’t just know football, expect Pens signings and merchandise to fill the TSE store at the Mall at Robinson, and tseshop.com where every day is game day. Question of the day: Pumpkin flavored everything has been trending for days, what pumpkin something are you addicted to OR what flavor would you rather? 5:52 Richard Bazzy: The famed Car Guru, Master of Marketing and Pittsburgh Icon, Richard Bazzy of Shults Ford joins the podcast in style as he discusses the origins of his signature cowboy hat and how he coined the phrase “YEEHAW!” Playful discussions included topics of his earlier days of becoming a car dealership entrepreneur, how the Pittsburgh market has changed today fro cars as well as the hopes of starting his own podcast! In Bazzy’s true, one-of-a-kind, genuine form, everything is laid out on the table of discussions. Find the link to Shults Ford’s website here: ShultsFord.com. 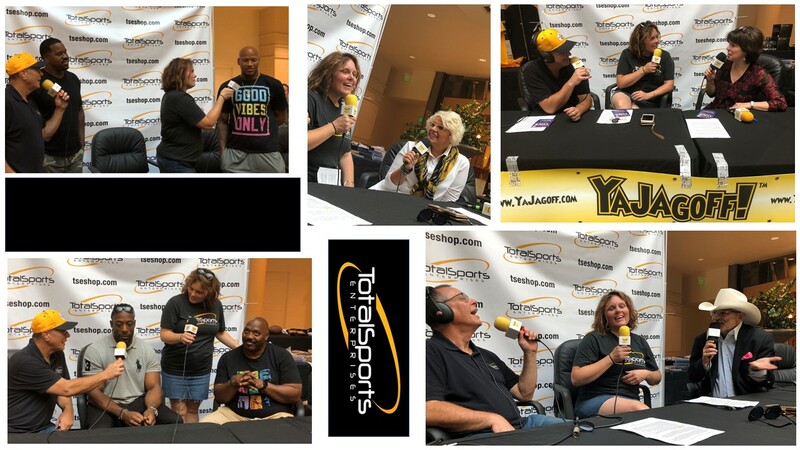 21:52 Linda Jo Thornberg: Linda Jo joins YaJagoff podcast with all smiles and wit in order to discuss the Annual Pittsburgh Business Show, which launches May 14th– 15th. Events in this show will be Speed Networking, Business Choice Awards and Pittsburgh Business Pitch. Other topics on the podcast included the empowerment of women in the workforce as well as the importance of local Pittsburgh business that make our Steel City thrive. The Pittsburgh business show is hosting a Business Networking Event, Wednesday, October 17th, 2018 starting at 6 PM. Tickets and additional information to the event can be found at PittsburghBusinessShow.com . 49:05 Jason Gildon & Levon Kirkland: Gildon discusses out-of-the-locker, game day routines which involve playful family-time. Superstitions are nonexistent for Kirkland’s determination for his success on game day, although he expresses his comedic side in using his daughter as tackling practice. All jokes and compliments to each player are a great combination for a strong Steeler team and nation, but wearing jersey attire on Church day does not fit that mix. 51:49 Joey Porter & Ryan Shazier: Porter discusses his underrated talent of being an auctioneer and sets the goal higher in raising money for future events. He is an all-star player in and off the field, and people across the United States come to see him. Shazier loves the company of his fellow fans as well and reveals his love for chocolate over pumpkin flavored anything. THERE’S NO PLACE LIKE HOME, YA JAGOFFS!